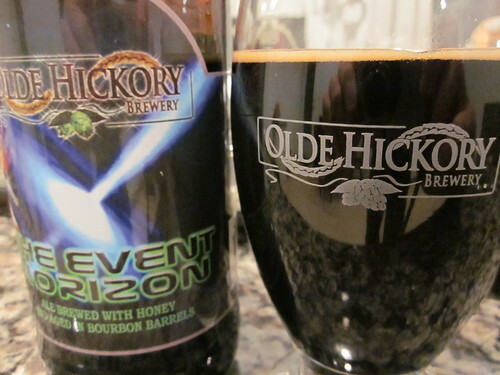 Olde Hickory The Event Horizon | Drink. Blog. Repeat. Now that it’s been a few weeks since my trip up to Charlotte for the release party for Olde Hickory‘s The Event Horizon and I figured the beer was a little less “hot,” so to speak, I recently decided to crack a bottle and see if it was just as good as it was at the release party back in November. To recap: Once a year, Olde Hickory puts out The Event Horizon, its entry into the burgeoning bourbon barrel-aged imperial stout field. Each year brings a new blend of barrels used to age the beer in, and 2012 spared no expense. The latest vintage spent time in Jack Daniels, Maker’s Mark, W.L. Weller and Pappy van Winkle barrels. With a little more than a month of age on it, the bottle I popped showed no signs of mellowing out. To start, the nose is a big, thick glob of sweet bourbon and oak. There’s a ton of black licorice, brown sugar and burnt coffee permeating the scent. There’s also a lot of sweeter notes from the honey. It’s thick and syrupy and rich and really oak-forward. It’s incredibly complex and just as I remembered it. The taste on the Event Horizon is almost too incredible to describe. There’s barely a pinch of roasted bitterness on the front of the tongue. It’s more rich and chocolatey, but a bitter dark chocolate. It’s velvety smooth across the palate and on the finish. It’s as if it melts across your palate. The bourbon pops up most on the middle of the palate and lingers beautifully on the back. It’s a big mix of all the different barrels its aged in. The heat has definitely worn off after a few weeks but you can still feel it in your chest and throat. The tastes are those big bitter coffee and dark chocolate notes. The honey adds to the sweetness and richness. It’s an incredible beer, to say the least. Coast’s BA Blackbeerd sets the standard for what a well-balanced bourbon barrel-aged imperial stout should be, but The Event Horizon – while still a little heavy on the alcohol heat and booziness – ranks up there as one of the most complex, bourbon-heavy but still incredibly enjoyable imperial stouts out there.